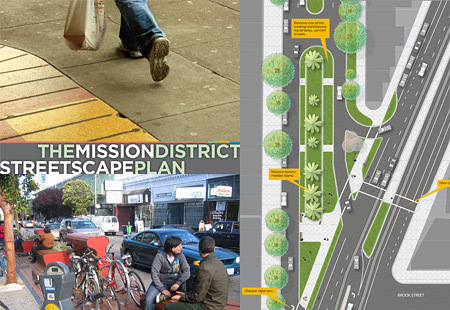 The Mission District Streetscape Plan is a community-based planning process to identify improvements to streets, sidewalks and public spaces in the city’s Mission District. 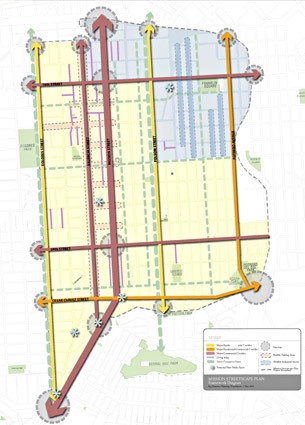 The boundaries of the study area are roughly Division Street on the north, US-101 on the east, Precita Avenue, Mission Street and San Jose Avenue on the south, and Dolores Street on the west. The goal of the Mission District Streetscape Plan is to re-imagine Mission District streets as vital public spaces that serve the needs and priorities of the community. The outcome will be a system of neighborhood streets with safe and green sidewalks; well-marked crosswalks; widened sidewalks at corners; creative parking arrangements; bike paths and routes; close integration of transit; and roadways that accommodate automobile traffic but encourage appropriate speeds. The Mission District Streetscape Plan designs will improve pedestrian safety and comfort, increase the amount of usable public space in the neighborhood, and support environmentally-sustainable stormwater management. Design review for improvements of existing public spaces. Workshop 4: August 12, 2009 – Presentation of draft plan; review of specific concept designs for focus areas. Once approved, the plan will set out a roadmap for getting the planned improvements built over time. To obtain a copy of the draft plan on CD, please email us. The Planning Department hosted a (PARK)ing Day space on 16th Street between Valencia and Guerrero on Friday, September 19, with the theme "(PARK)ing Day Everyday." We handed out information about the Mission Streetscape Plan and asked people for ideas of ways to permanently improve Mission District streets. Check out photos from (PARK)ing Day around the world.